I've wanted to read something by Philip Roth since the excellent Writers & Company interview with Roth in the spring1. It isn't particularly surprising that I never have; I have read astonishingly little. I have had a bit more time and inclination to read over the last few months, and it is hard not to be overwhelmed with great choices. It is easy to feel like you don't even know enough to start making choices. The desire to seek shelter in lists is enormous — "10 Great Novels of the 20th Century"-this and "The Western Canon"-that2. Roth shows up in most of these lists as a key voice, and an astonishingly consistent one. He has won awards, written bestsellers, and regularly makes critic's and reader's lists for this and that, and he has for 50 years. My library provides NoveList to subscribers, which provides "start with" guidance to readers for a given author, and this was the selection for Roth3. As usual, inspiration combined with science and the library to place this novel at the top of my list. The novel opens with the funeral of the protagonist, in a run down Jewish cemetery with deep family connection. His daughter and brother speak at length, his second ex-wife reflects on the impossibility of the situation, his bitter sons throw dirt on the coffin. His brother casts light on their childhood as sons of a jeweller in Elizabeth, New Jersey in the 1930s and 1940s, and on the bones of his life. While the skeleton materializes quickly (three wives, three children, one sibling, advertising creative who retired to paint) the mysteries materialize too. Why are his sons cold and bitter? What happened to these marriages? Why did he grow cold to his brother in his final year? What isn't mysterious is that the protagonist had medical problems for years. With the external view of him in retrospect settled, the body of the novel addresses his life from within, and is structured primarily by his medical history. The book moves through his childhood hernia operation (his first night sleeping in a strange place away from family) to his final heart problems with seven operations in seven years, the last fatal. While we learn the story of the life and the struggles of his body, many of the mysteries from the funeral are revealed. How two of his marriages ended, and how two of them started. We learn about his relationships with his children, we learn about his final years. While we skip back and forth, the medical history mostly progresses serially. So many at the end of their lives tell their stories as a sequence of surgeries and illness, here is a whole life told this way. Most readers will not find him wholly sympathetic, particularly his choices and impulses that lead to of the end of his second marriage. Nor will many enjoy his bleak but lucid outlook on his situation. But he is largely honest and aware of his mistakes and embarrassed by his troubling desires. He might unconvincingly justify his actions at times, but with a hint of resignation rather than anger. Genuine anger seems to bloom in him only with regards to his sons, who find any forgiveness impossible, and harbour sneering rage for decades. And perhaps there is some unfocused anger about his health, which bleeds into his relationship with his brother. 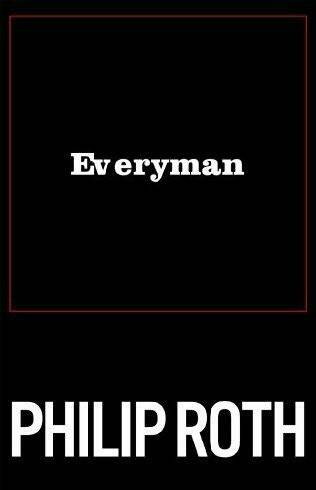 The title "Everyman" comes from the name of the unnamed protagonist's father's jewellery store; he picked the name to suggest that the jewellery was accessible to all, but also to avoid the challenges of a Jewish name. 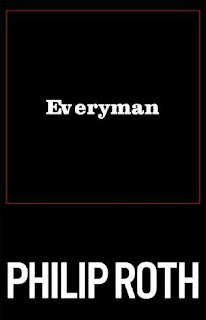 Roth invites the reader to determine in what way our nameless protagonist is "everyman"4, but it is clear that he isn't a typical "everyman" character. The structure of his childhood and adult life are not universal, and the reader isn't particularly welcome to identify with him. He is an everyman only in that he lived, he ages and he dies, and there is some universality in all of these. If this sounds bleak, in places it is. But in my reading, at least, it was bleak with a profound tenderness. There are a series of vignettes around death and aging that I think dance between something universal and something genuinely embodied. The protagonist teaches a painting class for a time in his retirement community, and he has an encounter there with a woman coping with persistent, horrible back pain, but without her husband who was (or she feels was) the key to her vigour. Her predicament is both immediate and unreachable, and Roth's tenderness towards her is cutting but never pitying, and always matter of fact. Roth's work here is tremendously skilled, circling around ideas, peeking at them from a couple of angles before the reader finds themselves submerged in them. The method allows him to work mostly in an accessible and undramatic way. The patterns and approaches become clear after you are finished; the reader's repeated visits to the same rundown ceremony build things up carefully, then leave the reader alone with the results. This sort of careful, human work tends to shatter me in the most rewarding way, and I have to admit I felt overwhelmed when I finished. In reading this novel (and currently reading his American Pastoral) I am developing sympathy with Roth's desire that literature be left to the readers and the reading. Trying to discuss or review or explain this sort of work feels like a disservice or worse. I should just say I revelled in the skill, was engaged by the narrative and moved by whatever there is here that goes beyond the narrative. Elinor Wachtel's interview with Roth is worthwhile. They discuss Everyman, but because he gives interviews so rarely, she discussed his whole career with her usual depth. I've occasionally joked that I could never be an author because I don't remember my childhood well enough to answer Wachtel's questions. Particularly overwhelming is Harold Bloom's list from The Western Canon with about a hundred key books before you reach Dante. The NoveList recommendation here seems very sound; this work is short, accessible and full of what I understand are key themes and settings for Roth. I think that the "start with" advice is somewhat uneven; I am not sure I would start Pynchon with Gravity's Rainbow, as it suggests. The NPR Fresh Air interview with Roth about Everyman explains his reasoning for leaving the character nameless. I love listening to Roth, but I don't think that this is a particularly good interview. My alternate theory about the lack of a name is that it is due to Roth's clear antipathy towards critics and writers about literature — they, like me above, are force to write "the protagonist" and "the unnamed narrator" and other similarly clumsy chore phrases.